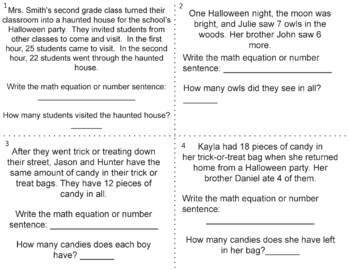 Halloween Math Word Problems - Addition and Subtraction Task Cards. 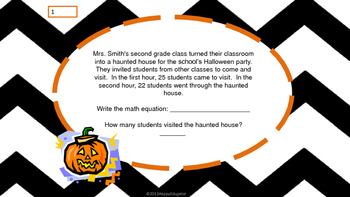 Fun Halloween math activity. 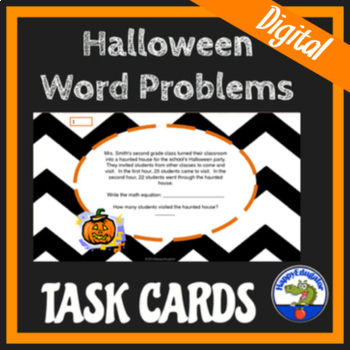 30 task cards with basic addition and subtraction word problems with a task card answer sheet included and key. 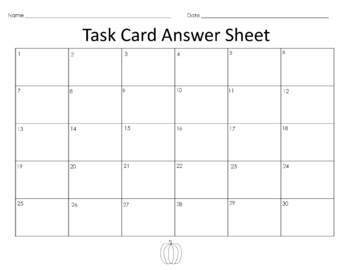 I have included full page size cards to project on an overhead and smaller cards to print out as task cards. You can also print out the large cards if you want to do a wall walk. However, I recommend printing the larger cards out in gray-scale so you save on ink. Number 31 is an optional cover page you probably won't need to print, unless you are saving them in a binder in page protectors and want a nice cover. You can also laminate and have students write on the cards with wipe off markers if you prefer. Print out four to a page by adjusting your settings before you print. if your printer doesn't allow you to do this, you can adjust the paper size. (I like to print out on 4 x 6 index cards.) You can then laminate for durability. Grades 1 - 3.